Welcome to PlymouthLights.com, home of Christmas at the Fischer’s Place — the annual Christmas lighting display of Tim and Cathy Fischer and family. We are located in suburban Minneapolis, Minnesota in the city of Plymouth. 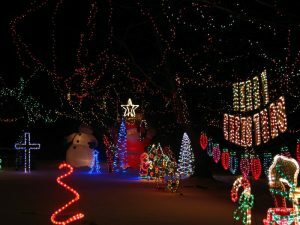 Our display runs each December, and features lights synchronized to music through computer-controlled programming and songs broadcast over an FM frequency (103.3) so you can watch the display in the warmth of your car as you enjoy the light show. 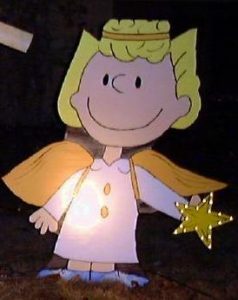 Before you come out, please read our display etiquette page to help everyone, including our neighbors, enjoy the season. 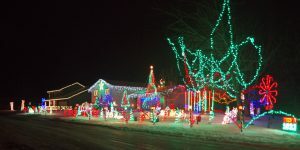 The “light show” concept was introduced to our display in 2003, and to the best of our knowledge was the first Christmas display in the Twin Cities to do this. We use over 5200 computer-controlled lighting circuits, including both Light-O-Rama and DMX lighting protocols, to animate the display to the music. For more technical information on how everything works, see use the options to your left. We often get asked why how we got started decorating to the extent that we do. This link will answer that question. Also, we hope you’ll take some time to reflect on the Meaning of Christmas. You can also learn how we got started. Have fun, and be sure to send your comments and suggestions to webmaster@fischersplace.com! Hope everyone had a wonderful and blessed Easter weekend. He Is Risen Indeed!